At Physical Therapy and Pilates Restoration in Cheshire, Connecticut, you will be treated by licensed, orthopedic specialized physical therapists also certified in the Pilates method. 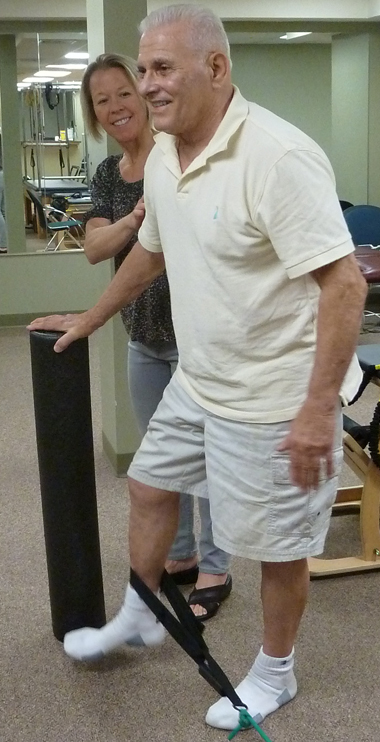 This unique blend of specialties allows us to provide a more total-body approach to your physical therapy care. As therapists, we utilize our knowledge and highly trained skills to properly diagnose and treat areas of soft tissue and joint dysfunction anywhere in your body. As Pilates practitioners, we focus on the quality of your movement, and delineate areas of decreased muscular control and mobility in need of the Pilates work. Unlike most physical therapy centers, we also have a wellness side to our business. After a course of P.T., many continue on with us in a Pilates mat or Reformer class, and have the comfort of knowing that we can continue to modify exercises as needed. If you should choose our business for Pilates wellness, you will find our practice unique in that all of our wellness classes are taught by physical therapists. This is attractive to many who might be afraid of getting injured at a more typical Pilates studio, or for those who have had difficulties tolerating Pilates on their own. Many of our clients have orthopedic conditions that require exercise adjustments, and as therapists, we are best suited to make those adjustments. I would recommend PTPR to anyone, but especially to those with back problems. There's just no one else around as specialized in treating the spine as Mollie and Kirsten. As a guy, I never thought I'd do Pilates, but after being introduced to Pilates in physical therapy, I realize how much it complements my other work -outs. Gaining flexibility and core strength is even improving my golf game. I love Pilates, but every time I tried my Pilates video at home, I would hurt my neck and back. Coming to work with Kirsten and Alyssa taught me how to perform the exercises correctly so that I am now getting the benefits I was hoping for.